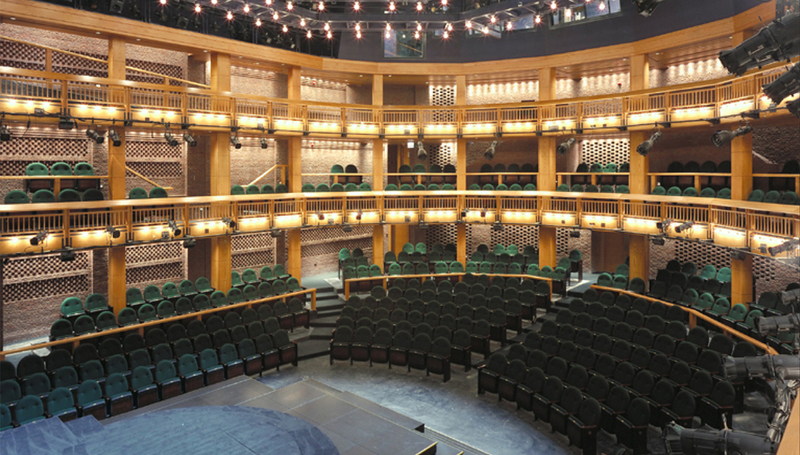 The Chicago Shakespeare Theater is a 540-seat, spoken-word thrust theater space on Chicago's Navy Pier. The compact and intimate theater space was conceived, designed, constructed and opened in just eighteen months. An additional design challenge included its siting, positioned in a narrow parcel, squeezed between a parking structure and the main concourse on the south side of the pier. The site resulted in a very narrow audience chamber [just 54 feet] and compact floor-to-floor spacing [derived from the adjacent parking structure]. Additionally, the proximity to tour and cruise boats docking on the pier presented a particular exterior noise isolation challenge, as these vessels sound an intense horn in the 250-Hz octave band as they arrive to and depart from the pier's edge, just 60 feet away from the house left wall. The interior palette is primarily common brick and wood. Patterned brick and pulled-brick in a Flemish bond were techniques used to scatter sound and prevent undesirable acoustic focusing.